J. M.W. Turner began his artistic career at a very young age. His success was fairly immediate, selling his first painting at just 12 years old. He continued to accomplish significant achievements at a remarkably young age, some that people others would never have the privilege of experiencing. Throughout his career he remained highly sought-after and acquired a very large fortune from his commissions. He is remembered as an influential painter, said to be the best landscapist of the 19th century, and a key artist to influence the Impressionist movement. He is most well-known for his original interpretations of bringing light and color to his canvases. Turner was born the son of a barber. Though he would maintain a very close relationship with his father later in his life, young Turner was sent to live with his uncle. He was just 10 years old. Just two years later his drawings were purchased by his father's clientele who could early identify the artist's budding talent. 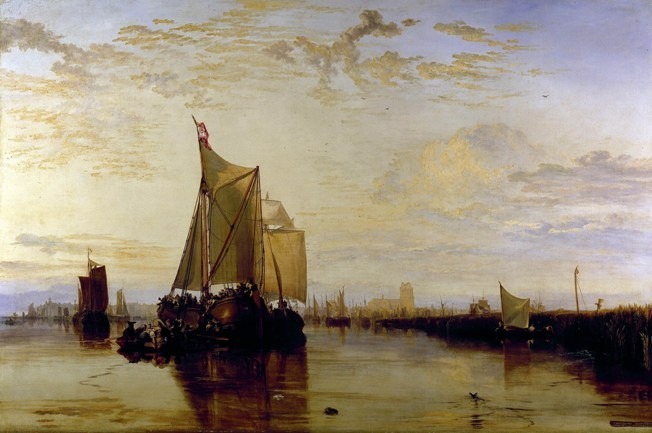 At 14, Turner entered the Royal Academy schools where he exhibited his watercolors. The work he displayed while at this school was mainly topographic and evidence that he imitated English masters of his day. At age 19 he got a job as a reproduction artist, making copies of the unfinished drawings of John Robert Cozens, a recently deceased landscape painter. The influence of Cozens, and Welsh landscape painter Richard Wilson aided in the subject matter of who would become the greatest landscapist of the 19th century. In 1796 Turner began to exhibit oil paintings in addition to his watercolors at the Royal Academy. 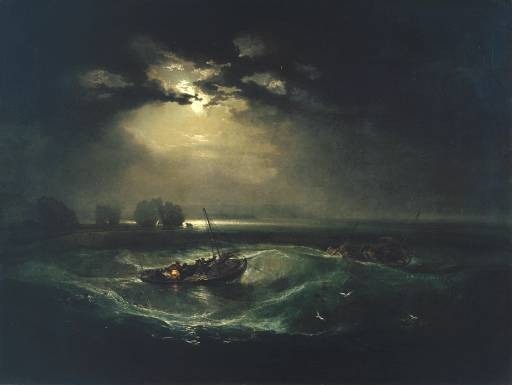 Critics were delighted with his Fishermen at Sea (1796) which featured a moonlight scene. This positive reception, perhaps aided in turners election as an associate of the Royal Academy, he was 24, the youngest permitted age for such an honor. 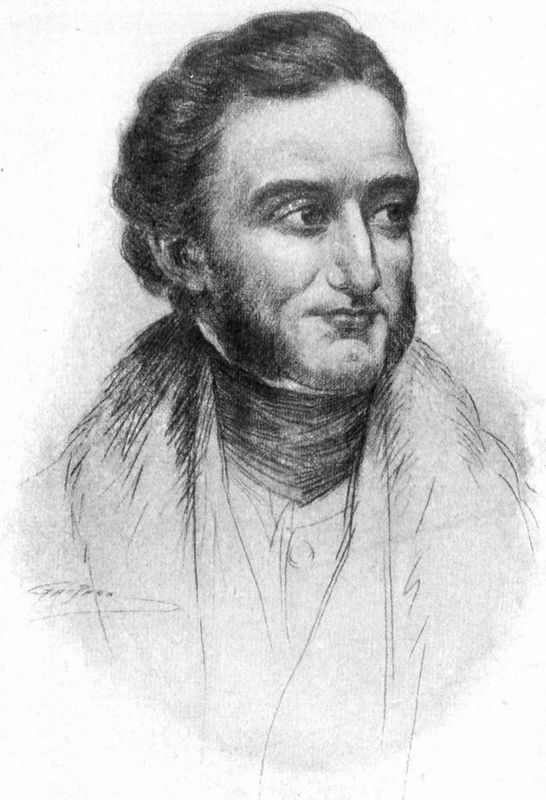 In 1802 he became a full academician and by 1807 he was appointed professor of perspective. Turner's mother became ill and entered into a mental hospital in 1800. This is about the time Turner's father went to live with him, and he devoted the rest of his life to being Turner's studio assistant and agent. Around this time, as he was overwhelmed with commissions, Turner was able to open his own studio. Turner travelled in quest for inspiration. He travelled throughout England and Wales and throughout Europe where he picked up the his love for marine subjects. As Turner matured as an artist, his paintings became more luminous and atmospheric. Although his work was topographic, most of his focus was directed on the effects of light. He continued marine paintings and started to incorporate the natural forces in his work. The masterpiece of his middle years is said to have been Dort, or Dordrecht, the Dort Packet-boat From Rotterdam Becalmed (1818). Around 1817, Turner set out for his first trip to Italy, spending three months in Rome, and visiting Naples, Florence and Venice. During this adventure, he produced about 1,500 drawings which later turned into paintings. His style advanced and his colors became purer and more prismatic. 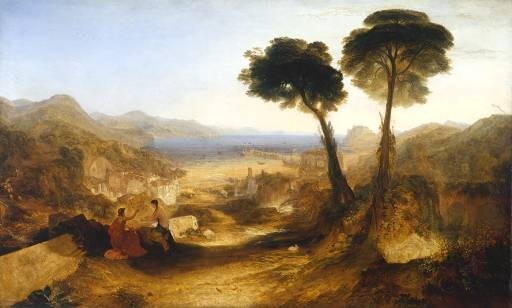 The Bay of Baiae, with Apollo and the Sibyl (1823) is an example of Turner's progression. He began to treat oil paint as water color making the colors almost transparent. He continued to travel around England, Scotland and the rest of the continent for inspiration. In 1829, Turner's beloved father passed away. One can only try. Turner kept his "eccentric" private life very secretive. Though he was unsociable he had a 10 year affair with widow Sarah Danby. He may have fathered her two daughters. Turner's work continued to evolve in his later years. He traded the accurate observation of architecture and natural detail of his earlier work for a precision in accordance with the effects of color and light. 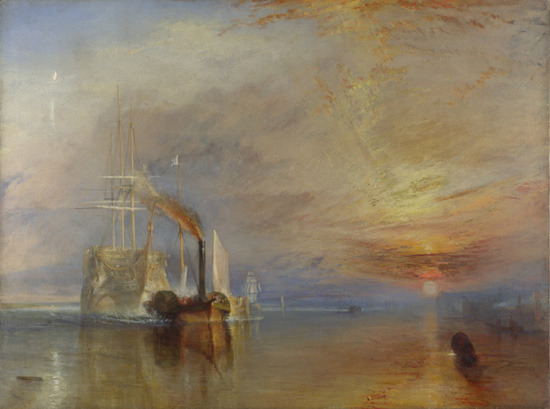 An example of this is The Fighting Temeraire (1838). This piece acts as a tribute to the passing age of ships, as replaced by steam powered vessels. This time around, his canvases suggest movement through abstractions of the actual object that is moving. Rain, Steam and Speed - the Great Western Railway (1844) is another expression of Turner's interest in the industrial revolution. Here one can see the abstraction of the train. Although the object may not be clear, the fluid movement of the piece is evident. Turner continued to paint and travel throughout the last 15 years of his life. He died at the age of 76, in 1851 in Chelsea. According to his wishes, he was buried in St. Paul's Cathedral. The $140,000 he left to fund a charity was dispersed amongst distant relatives. He had planned that the majority of his fortune would help "decayed artists. " He agreed to give his finished painting to the National Gallery on the terms that a separate gallery would be built to house them only. Again, against his dying hopes, his works instead became national property. It wasn't until 1908 that a gallery was built for some of his paintings at the Tate Gallery. 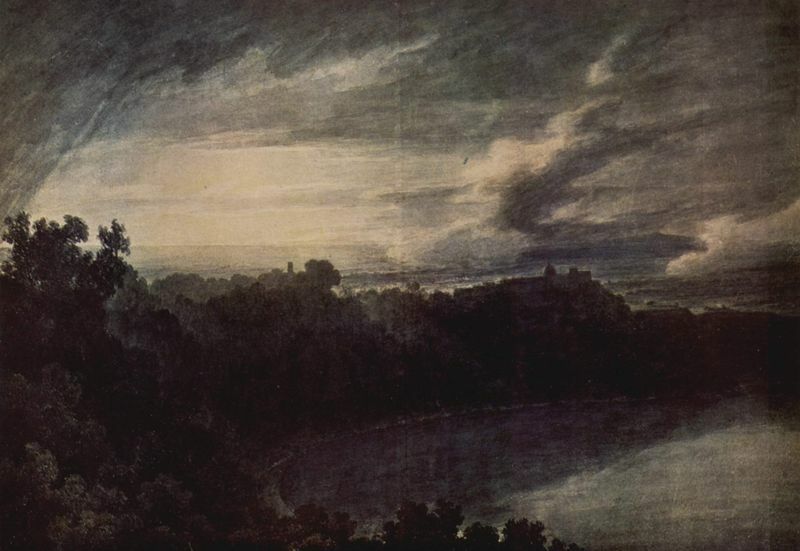 Turner is remembered as the pioneer of light color and atmosphere.